"THE STRANGERS ARE APPROACHING THE CITY, CLOSE THE GATES" This performance was devoted to the local Roma (Gypsies), who had to escape, fearing for their lives, from Zadar (Croatia) when the war between Croats and Serbs started in 1991. According to my investigation of former Roma settlements in Zadar, to this day, six years after the final operation of this war (which the Croatian military labelled "Storm" in 1995), none of the Roma who left has returned. Operation Storm was led by the Zadarian general Gotovina and resulted in many cases of ethnic cleaning of "non-Croatians". 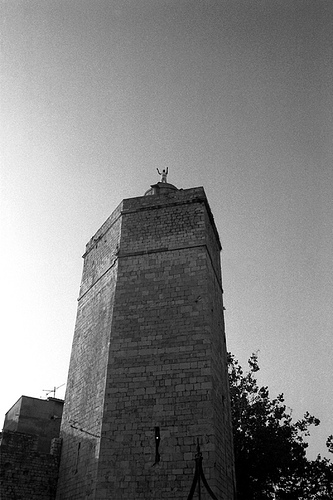 One of the significant monuments of Zadar, recognized by the locals, is a sculpture of an angel standing on the very top of the tower in the center of the city. It is turning in the direction of the wind. I picked a nearby tower as the destination of my performance. The city of Zadar was surrounded in medieval times by tall walls and this tower served as a post for an observer, who by screaming alerted the town when strangers (for example Roma) approached the city. When strangers approached, the city gate would be closed and they would not be allowed to enter I stood on the top of this tower for an hour and mimicking the angel sculpture. I screamed repeatedly in Croatian: THE STRANGERS ARE APPROACHING THE CITY, CLOSE THE GATES! I used a wireless microphone attached to my body and amplified by a powerful speaker system placed on top of the tower. The sound was heard within a significant part of the city and people on the streets stopped and stared at me. During the performance a medical emergency car approached the tower followed by a police car. But no arrest was made.